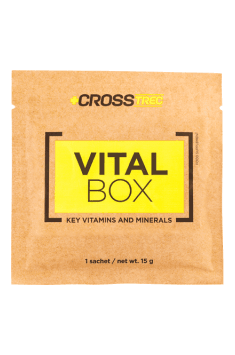 VITAL BOX CrossTrec is a vitamin-mineral supplement forming part of the CrossTrec innovative product line, designed for people who prefer intensive functional training, including high-performance athletes. It has increased doses of vitamins B1, B2, B3, B6 and B12, as well as A and E, which deficiency (of which above mentioned people are particularly vulnerable) induces oxidative stress, which is the cause of many serious diseases, as well as to accelerate the process of aging. 1 sachet per day (dissolved in 300 mL of water) after the meal. Use for no more than 3 months. The perfect blend of vitamins and minerals. Convenient sachets for easy use - simply dissolve it in 300 ml of water. I would especially recommend to athletes to replenish vitamins and minerals lost during heavy exercise. Take the dosage recommended by the manufacturer - 1 sachet per day. For proper nutrient absorption, take immediately after a meal. It contains gurana extracts, a natural source of caffeine, which is why I do not recommend using it in the evening, as it can cause sleeping problems. Optimum period of application is three months, allows you to offset possible shortages of vitamins and minerals in the body. After this time, I suggest taking a few months break.